2 We know different people get paid different wages. In this section we focus on the differences in the JOBS that lead to differences in pay. Later we look at differences in people. Adam Smith way back in 1776 said people choose an occupation based on not only the wage, but on all the attributes of the occupation. Attributes can be positive and negative. 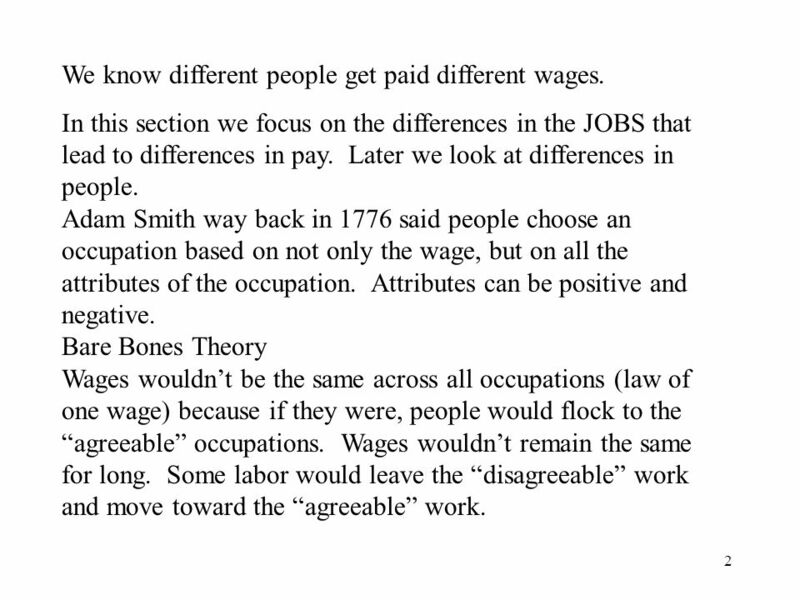 Bare Bones Theory Wages wouldn’t be the same across all occupations (law of one wage) because if they were, people would flock to the “agreeable” occupations. Wages wouldn’t remain the same for long. Some labor would leave the “disagreeable” work and move toward the “agreeable” work. 4 Wd Sd2 Sa1 Sd1 Sa2 Wo Da1 Dd1 Wa agreeable	disagreeable work-	work- cool	hot quiet	stinky Assume other costs and benefits of the two jobs are the same. Wd - Wa is a compensating wage differential. The differential equalizes the net attractiveness of each occupation. 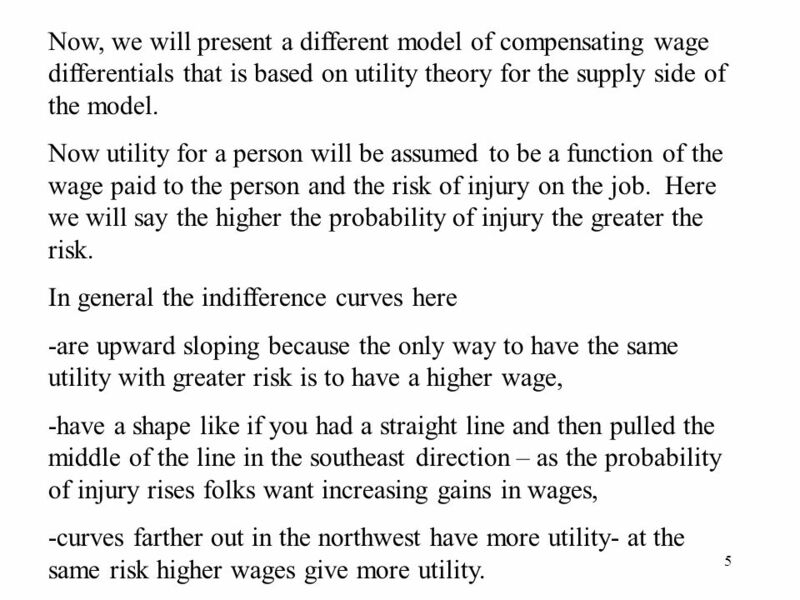 5 Now, we will present a different model of compensating wage differentials that is based on utility theory for the supply side of the model. Now utility for a person will be assumed to be a function of the wage paid to the person and the risk of injury on the job. Here we will say the higher the probability of injury the greater the risk. In general the indifference curves here -are upward sloping because the only way to have the same utility with greater risk is to have a higher wage, -have a shape like if you had a straight line and then pulled the middle of the line in the southeast direction – as the probability of injury rises folks want increasing gains in wages, -curves farther out in the northwest have more utility- at the same risk higher wages give more utility. 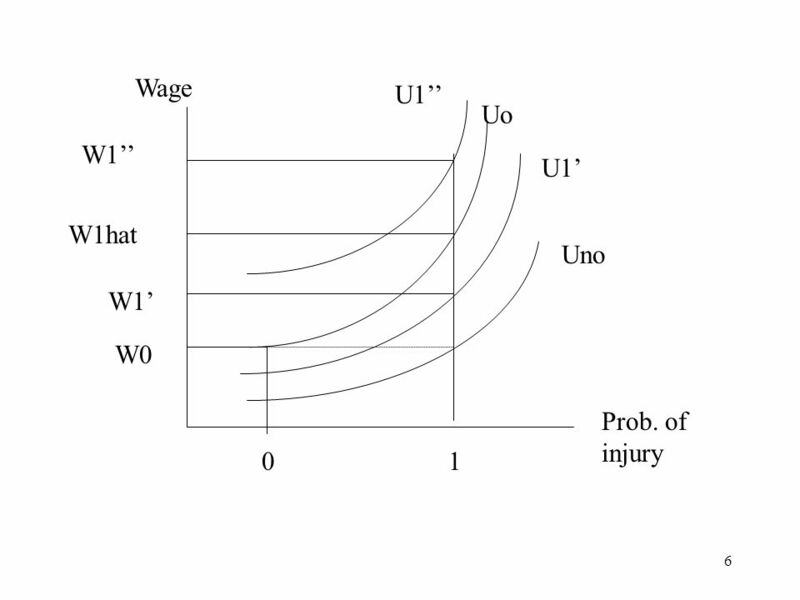 Wage W1hat is a dividing line wage. 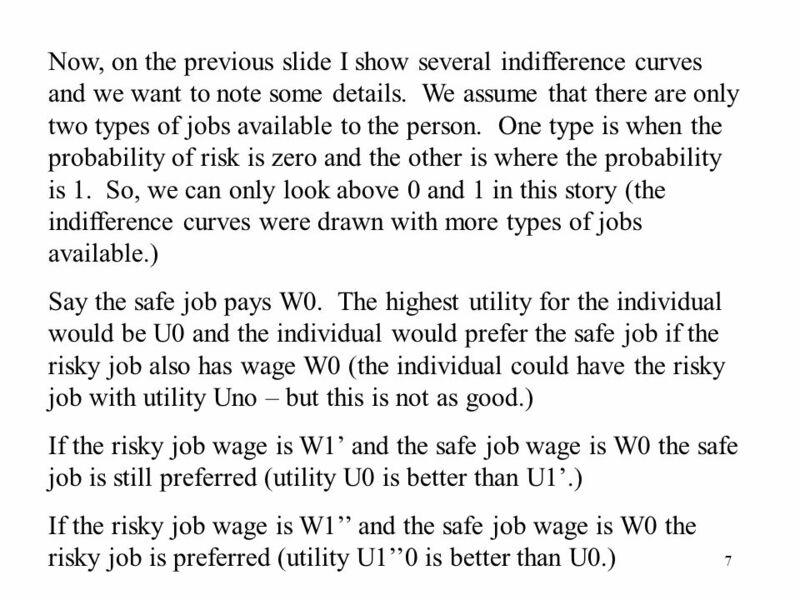 Assuming the safe job wage is W0, then W1hat is the wage for the risky job that leaves the individual indifferent between the two jobs. 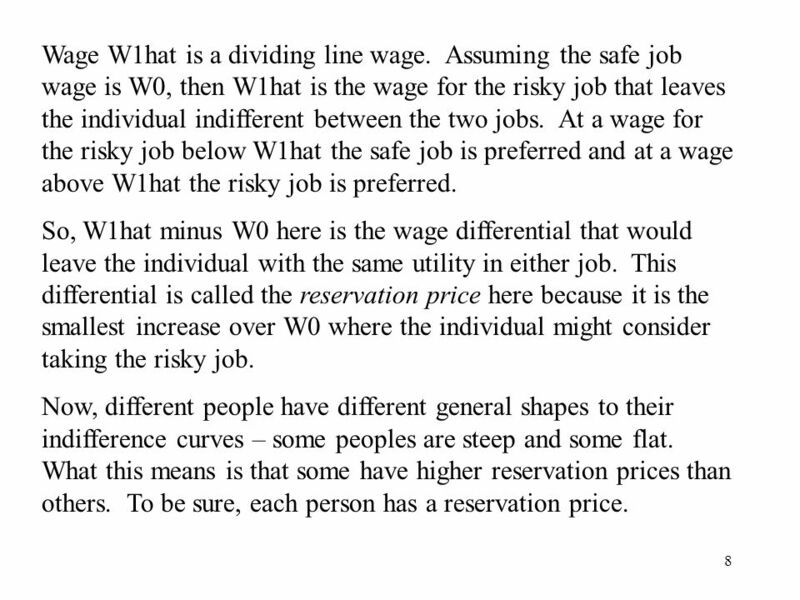 At a wage for the risky job below W1hat the safe job is preferred and at a wage above W1hat the risky job is preferred. So, W1hat minus W0 here is the wage differential that would leave the individual with the same utility in either job. This differential is called the reservation price here because it is the smallest increase over W0 where the individual might consider taking the risky job. Now, different people have different general shapes to their indifference curves – some peoples are steep and some flat. What this means is that some have higher reservation prices than others. To be sure, each person has a reservation price. 11 Firms could eliminate risk of injury on the job by paying out money to make things safer. Or, they could keep the jobs risky and just pay out higher wages. 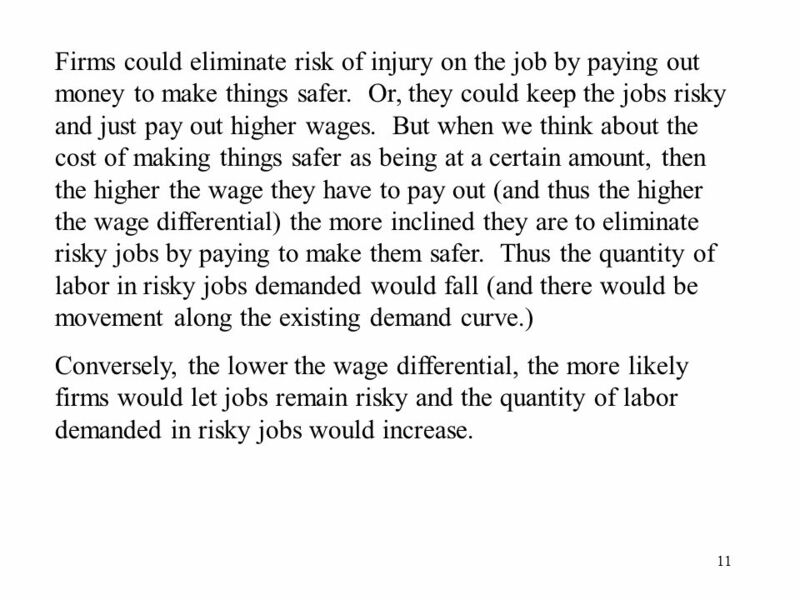 But when we think about the cost of making things safer as being at a certain amount, then the higher the wage they have to pay out (and thus the higher the wage differential) the more inclined they are to eliminate risky jobs by paying to make them safer. Thus the quantity of labor in risky jobs demanded would fall (and there would be movement along the existing demand curve.) Conversely, the lower the wage differential, the more likely firms would let jobs remain risky and the quantity of labor demanded in risky jobs would increase. 12 Ethics Alert Parker, you mean to say some firms know their work environment is not totally safe? WOW, those buggers could eliminate some risk by spending some cash? Those dirty birds! What would you do? Seems to me you can make the work environment real safe, but then you are not able to pay the workers as much. Can you do both? This is just me, but if you can do both, do it! 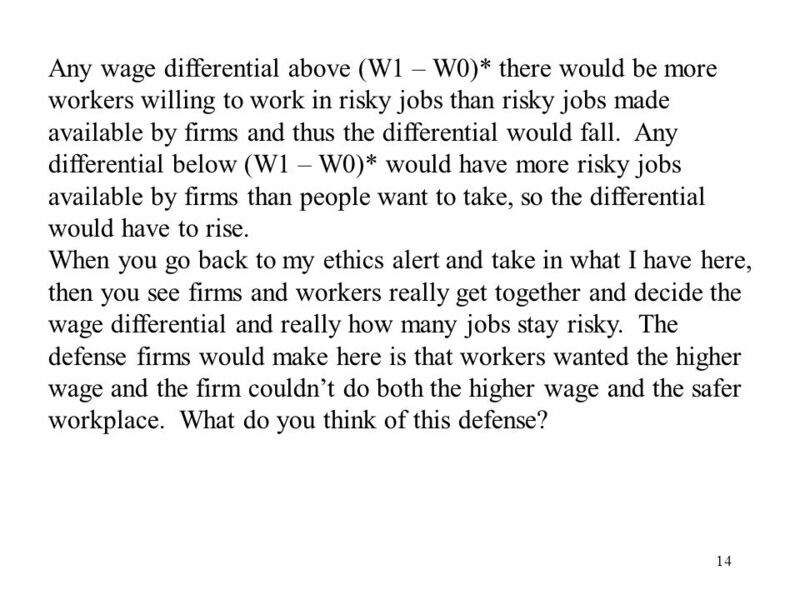 Any wage differential above (W1 – W0)* there would be more workers willing to work in risky jobs than risky jobs made available by firms and thus the differential would fall. 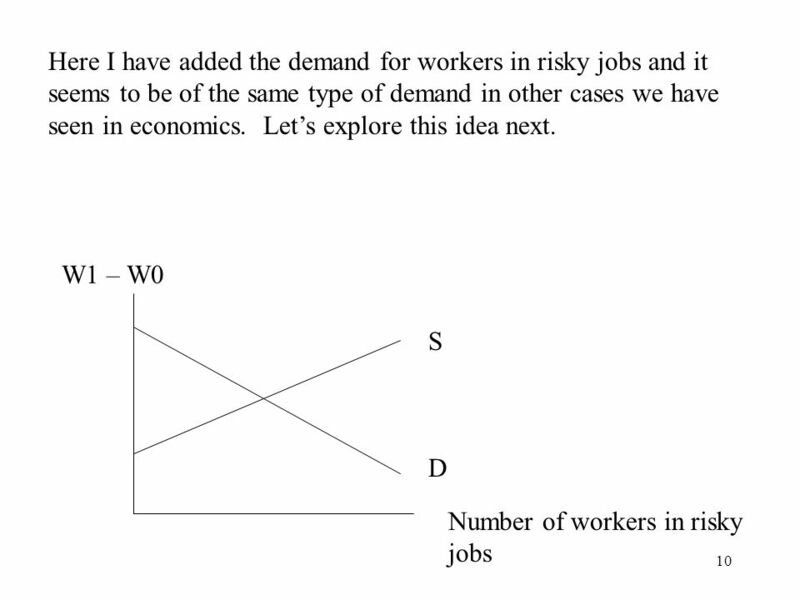 Any differential below (W1 – W0)* would have more risky jobs available by firms than people want to take, so the differential would have to rise. 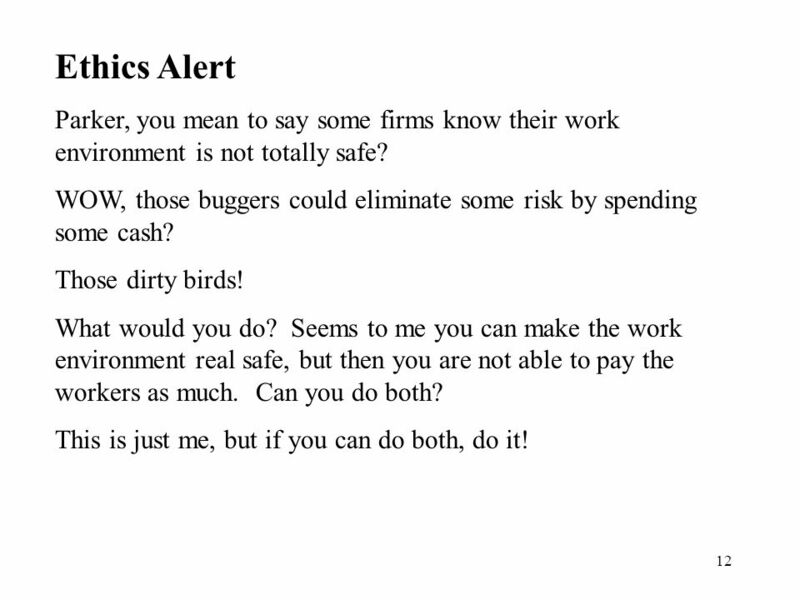 When you go back to my ethics alert and take in what I have here, then you see firms and workers really get together and decide the wage differential and really how many jobs stay risky. The defense firms would make here is that workers wanted the higher wage and the firm couldn’t do both the higher wage and the safer workplace. What do you think of this defense? The author has another defense about having risky jobs. 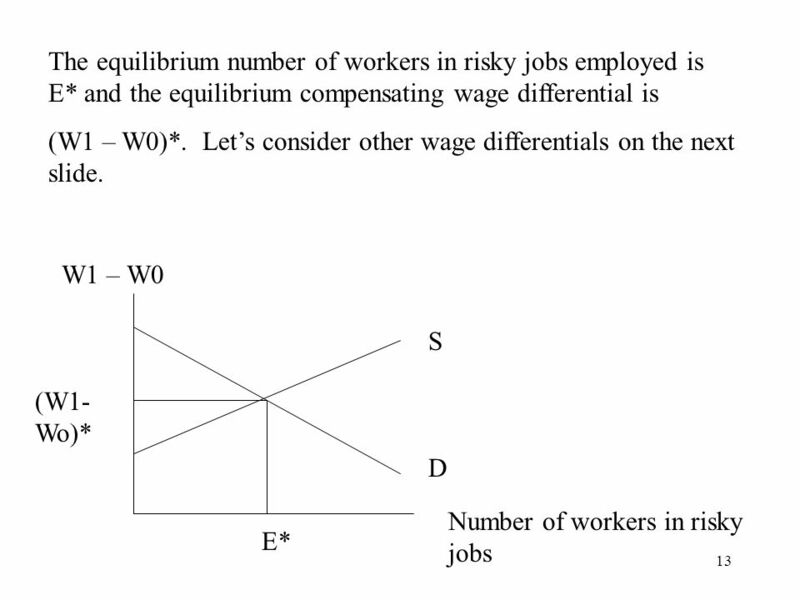 At the equilibrium wage differential (W1 – W0)*, all the workers employed except the last one get paid more than they need to induce them to supply the labor in the risky situation. How do we know this? Well, if (W1 – W0) was a little lower than (W1 – W0)*, then all the workers except the last one would still work. 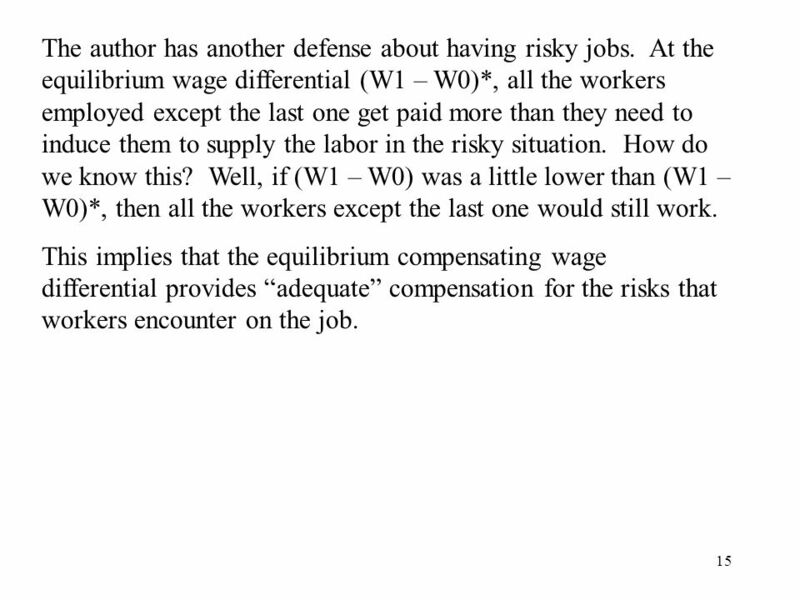 This implies that the equilibrium compensating wage differential provides “adequate” compensation for the risks that workers encounter on the job. 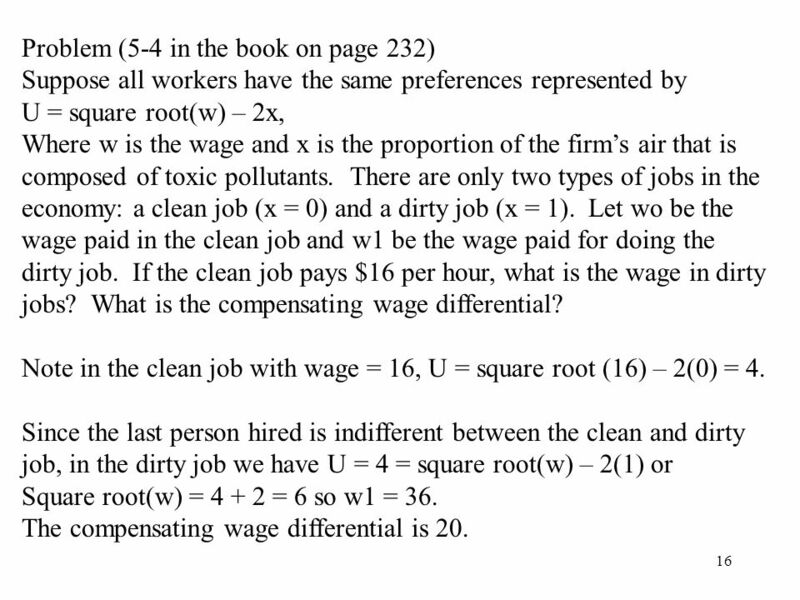 Suppose all workers have the same preferences represented by U = square root(w) – 2x, Where w is the wage and x is the proportion of the firm’s air that is composed of toxic pollutants. There are only two types of jobs in the economy: a clean job (x = 0) and a dirty job (x = 1). Let wo be the wage paid in the clean job and w1 be the wage paid for doing the dirty job. If the clean job pays $16 per hour, what is the wage in dirty jobs? What is the compensating wage differential? Note in the clean job with wage = 16, U = square root (16) – 2(0) = 4. Since the last person hired is indifferent between the clean and dirty job, in the dirty job we have U = 4 = square root(w) – 2(1) or Square root(w) = = 6 so w1 = 36. The compensating wage differential is 20. 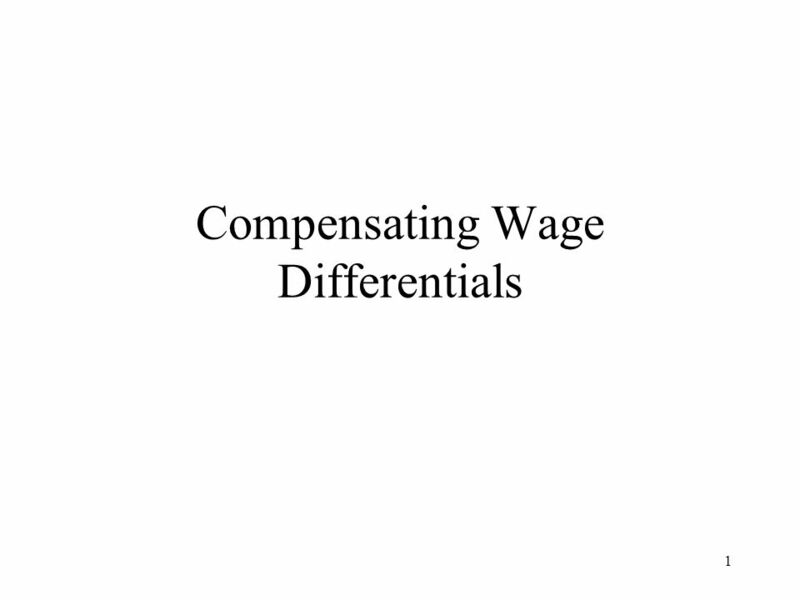 Download ppt "Compensating Wage Differentials"
8 CHAPTER Possibilities, Preferences, and Choices. Chapter 8 Compensating Wage Differentials and Labor Markets. The Budget Constraint Here we explore the combinations of consumption and leisure the individual can obtain. Section 1: What factors affect price? This is an example of government intervention in a market. Mandated benefits Here we want to define the idea of mandated benefits and see what impact this type of benefit has on the market. 1 Changes in wage and the work decision here we explore the income and substitution effects of a wage change.